Nuclear quadrupole resonance (NQR) spectroscopy is a method to characterize chemical compounds containing quadrupolar nuclei (QN). Similar as in nuclear magnetic resonance (NMR) the sample under investigation is irradiated with strong radiofrequency (RF) pulses to induce and detect transitions between sublevels of nuclear ground states  . NMR refers to the situation where the sublevel energy splitting is predominantly due to nuclear interaction with an applied static magnetic field, while NQR referes to the case where the predominant splitting is due to an interaction with electric field gradients (EFG) within the material . Quadrupole splitting is possible if the charge distribution of the nucleus has an electric quadrupole moment. This is the case if the spin quantum-number I is greater than 1/2. The electric quadrupole moment of the nucleus interacts with the EFG which is caused by a non-spherical charge distribution of the environment of the nucleus. where m is the magnetic quantum number (m = -I, -I+1, ..., I-1, I). 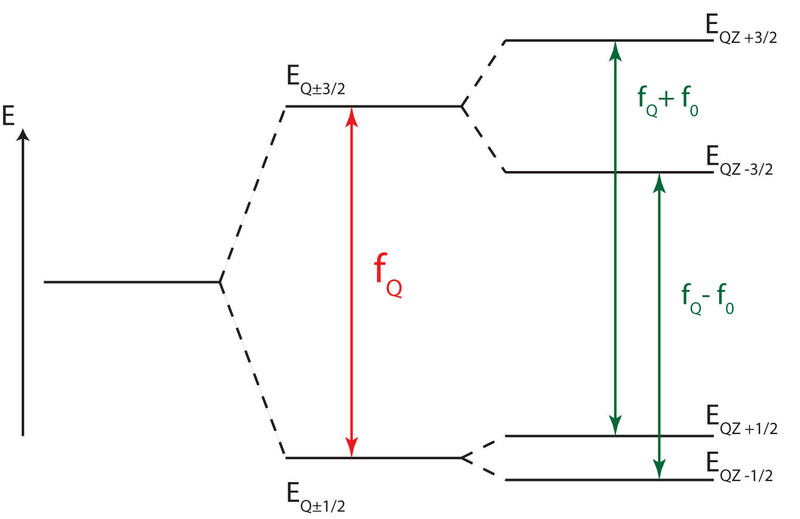 The quadrupole frequencies fQ(m-m') are corresponding to the difference between two energy levels (Em - Em'). For the more general case of η ≠ 0, a correction function fη hast to be multiplied with fQ(m-m'). If η=0, fη=1 for every kind of nucleus. For quadrupole nuclei with a higher spin quantum number I than 3/2 an exact solution for fη is not known . One option to get accurate results is to use tabulated iterative calculation results. The Landolt-Börnstein tables provide an easy and precise method to determine values for quadrupole frequencies and correction functions for nuclei with spin quantum number I > 3/2. Another possibility is just to diagonalize the quadrupolar Hamiltonean numerically and calculate the respective eigenvalues for arbitraty η .
where fLarmor is the Larmor frequency at the presence of a static magnetic field B0. γ is the specific gyromagnetic constant of the nucleus. Spin 3/2 nuclei have two quadrupolar energy levels and therefore only one transition frequency . Fig. 1 shows the energy spectrum in case of η=0 in the absence (EQ) and in the presence (EQZ) of an external magnetic field B0. We here assume that the quadrupolar coupling is much stronger than the Zeeman interaction. The corresponding frequency spectrum is shown in fig. 2. In the presence of a weak B0 the initial transition frequency (fQ) is split into two distinct frequencies (fQ - f0, fQ + f0). The shift frequency f0 depends on fLarmor and on the angle α between the direction of Vzz and the direction of B0. The animation shows how the energy levels and the frequency spectrum of fig. 1 and 2 build up. It is clearly recognizable that the pure quadrupole frequency fQ disappears under the presence of an external magnetic field B0. Fig. 3 shows the energy levels in the absence (EQ) and in the presence (EQZ) of a weak external magnetic field B0 for quadrupole nuclei with a spin quantum number of I=9/2 (η=0). The frequency spectrum corresponding to the energy spectrum is shown in fig 4. In the presence of B0 the pure quadrupole frequencies disappear (brown) and twice as many peaks are detectable. This is just valid for systems with perfect mono-crystalline structures. In case of powders or substances with many crystalline each peak is converted to a broad frequency distribution (pake-doublet). In systems with small values of η only transitions of ∆m = ±1 are allowed . Figures 3-5 show fη(m-m') depending on η for transitions of ∆m = ±1. Figure 1 shows the energy spectrum of I=3/2 nuclei in the absence (left) and in the presence (right) of a weak external magnetic field. Figure 2 shows the frequency spectrum corresponding to the energy spectrum shown in fig.1. Figure 3 shows the energy spectrum of I=9/2 nuclei in the absence (left) and in the presence (right) of a weak external magnetic field. Figure 4 shows the frequency spectrum corresponding to the energy spectrum shown in fig.3.